Yeah, that’s the kind. All of the stupid variants that have sprung forth from this incredible farce of a “safety device” … it’s a meme that should never have taken off, but did. 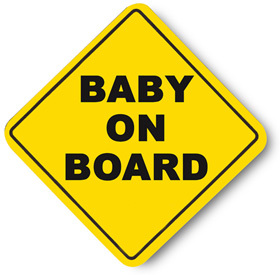 Every time you glance at a car with a little yellow and black square in the window, it doesn’t even matter what it says, the “baby on board” pops into my head. Oh yes, someone went there. To whoever it was, I salute you. That is just made of win–I need to get one for my car. Anyone know where they can be bought? Mike: Thanks so much for the tip–now I know where I can get a “Brat on Board” doll! Thank you! I hate hate hate those signs. And I hate the notion that if you have a baby somehow your life matters more. I worry when I have vulnerable people or animals in my car, but I drive defensively, and I would never put one of those idiotic stickers on my car. Those babies grow up too, and then what? Why do babies matter more than adults? Given their potential for wasting rescue workers time, and just the general smugness of them, they should be outlawed. I’d love to see “I don’t care if you have a baby on board stickers,” (I remember the “illegal aliens in trunk” stickers in the eighties. )although yours really “drives” it home, thank you. I drive carefully no matter what, but honestly, if you have a baby on board, I don’t care. And there are probably a lot of otherwise careful drivers who see these stickers and respond rebelliously, even sadistically, and drive badly. It’s tempting. 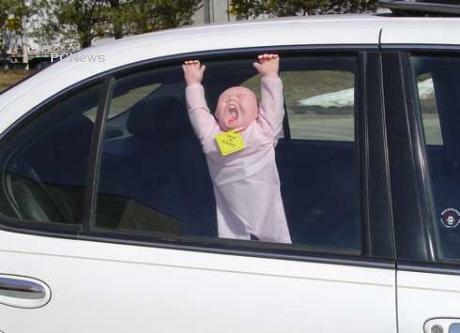 I happily have a baby on board sign hanging up in my back window. I dont look at it as “look at me, I am so much more important than all these people” I look at it as, Hey, if I am in an accident.. Dont worry about me, get my baby out first. My father in law, and dad are both paramedics. 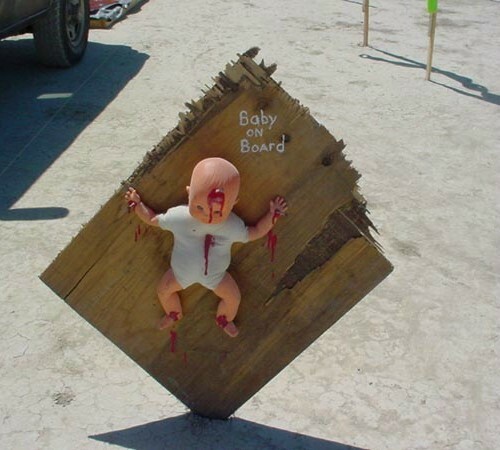 It helps them to know that there is a baby on board and they need to get them out before, because they are more fragile than adults. SORRY but I am definitely keeping mine up and smiling with pride as I know my son will be rescued before myself in case of an emergency. I hate these signs because they imply that babies are the only ones out of any of us who are of value. The rest of us are worthless once we leave infancy and stop being so adorably photogenic and cuddly. I have one of these signs in my car’s back window, but I’ve altered it. I covered up “Baby” with yellow electrical tape and wrote “I’m” over it. So my sign reads “I’m on Board.” Meaning, my life, my existence has just as much value as any baby’s. I really hope you guys do not have children.. Especially if you think you are much more important than a child. I would definitely risk my life over a child’s ANY day! I wish more people would put “Low Information Voter On Board” so when they are in an accident, I’d know which car to ignore while it’s engulfed in flames.